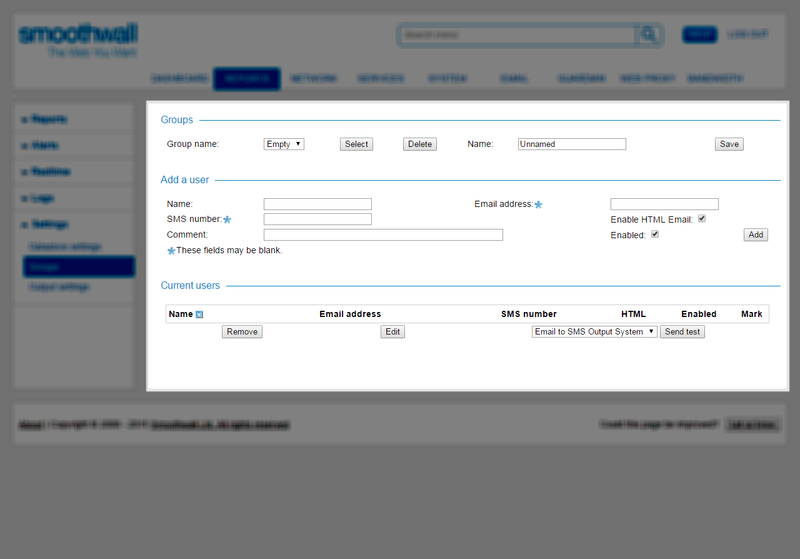 You can configure the Smoothwall to email scheduled reports to users, or groups of users. Alerts can also be sent via email, or SMS. To be able to use Smoothwall's email and SMS feature for alerts, reports, and Safeguarding notifications, you must configure user groups, and the group members who will receive alerts and reports. Note: Even if you want to send an email to a single user, you must still create a group for them. Go to Reports > Settings > Groups. Select the next Empty group from Group name. You may have to scroll to the bottom of the list to find it. Enter a meaningful Name for this group. If required, enter their Email address. You can leave this field blank to only notify via SMS. 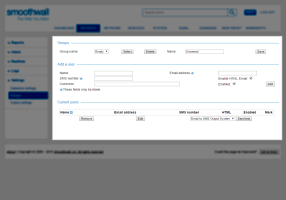 Select Enable HTML Email to send reports in HTML format. This is the preferred format as the layout of the report you see on the screen is honored. If required, configure an optional Comment for this user. Clear the selection for Enabled to prevent emails and SMS going to that user but keeping them a member of this group, otherwise leave it selected. You can test the configured details to ensure the emails and SMS are received. Add email and SMS server details to Reports > Settings > Output settings as described in Configuring Report and Alert Output Settings. From the Groups panel, select the relevant Group name. From the bottom of the screen, choose either Email to SMS Output System or SMTP (Email) Output System depending on the selected group's settings. To add additional users, see Creating alert and report groups. To edit an existing user's details, Mark the relevant row and click Edit. Adjust the configuration as required. To delete users, Mark the relevant row and click Remove. Note: Deleting a group also deletes all group members, but does not remove the users from the directory.